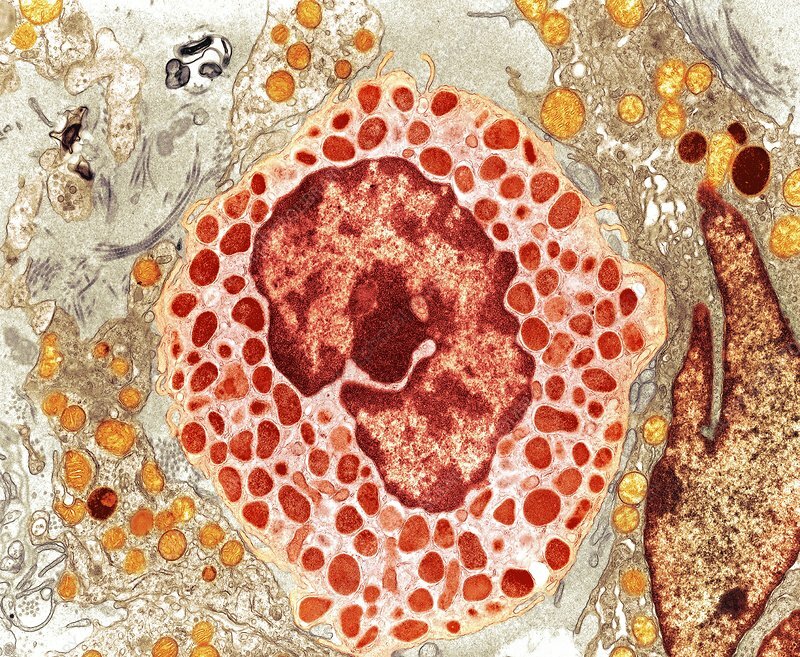 Mast cell, coloured transmission electron micrograph (TEM). Mast cells (mastocytes) are a type of white blood cell (leukocyte) found in connective tissue. The large oval (brown) is the cell's nucleus, which contains its genetic information. Within the cell's cytoplasm (pink) are granules (red) containing chemical mediators, including histamine and heparin. When the mast cell is activated, either by an allergic reaction or in response to injury or inflammation, these granules are released into the tissues. Histamine is responsible for the symptoms of an allergic reaction, such as itching, and heparin prevents blood from clotting. Magnification: x6,700 when printed at 10 centimetres wide.